Asthma is one of the most frequent reasons for pediatric hospital admission and a significant source of cost for pediatric healthcare nationally. It is also the most costly cause of preventable hospitalization in childhood. Although there is strong evidence to guide acute and preventative therapy for youth with asthma, adherence with such therapy is highly variable. Prior research has shown that only 60-75% of children with persistent asthma fill a prescription for controller medications over an entire year and the percentage with monthly fills is much lower. Understanding ways to improve adherence with care recommendations for youth with asthma, especially after hospitalization, may help reduce repeat hospital admissions and improve the care of youth with asthma in the community. 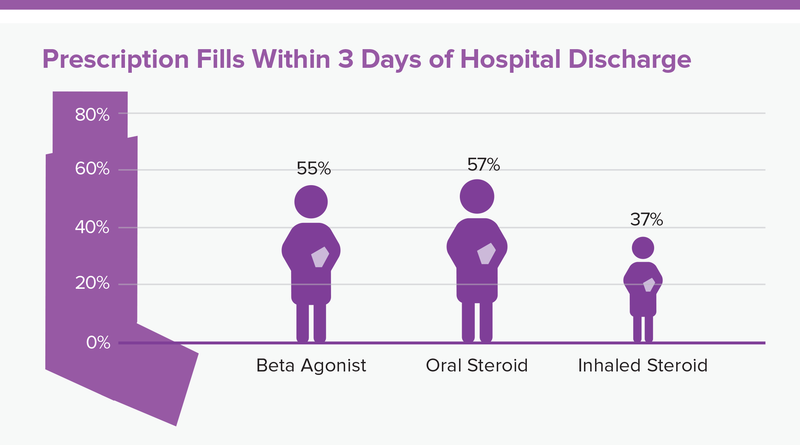 Within 3 days of discharge, only 55% of children filled a prescription for a beta agonist, 57% for an oral steroid, and 37% for an inhaled steroid. To determine the relationship between patients filling asthma prescriptions after being discharged from the hospital and hospital readmission rates, we conducted a study to determine the proportion of Medicaid patients from 2005-2007 who filled recommended discharge prescriptions within three days of pediatric asthma hospital discharge. We hypothesized that filling prescriptions of three classes of asthma medications prescribed during hospitalization (short-acting beta agonists, oral steroids, and inhaled steroids) within three days of hospital discharge would be associated with a reduction in readmission at various intervals. These three classes of asthma medications are typically prescribed following asthma hospitalization for immediate relief of ongoing symptoms (beta agonists), treatment of prolonged flare-ups (oral steroids), and prevention of future symptoms and flare-ups (inhaled steroids). We then conducted a research synthesis to gather the evidence for hospital therapies delivered to asthma patients outside of the intensive care unit, including routine care, care escalation and discharge care. We also summarized recent literature on quality improvement efforts focused on hospital care and highlighted future opportunities for improving both hospital care and transition back to the home environment. These studies add to the evidence base on the value of treatment for asthma with beta agonists and inhaled steroids following hospitalization. The team is in the process of enhancing the discharge care process for children with asthma at Children’s Hospital of Philadelphia and plans to build novel interventions with regional hospitals and payers to reduce barriers to evidence-based treatment at the time of hospital discharge. This included interventions that use electronic medication sensors and mobile technology to increase preventive medication use. Uniting these approaches with other community-based approaches will help deliver better health outcomes to youth with asthma, particularly in large urban areas. Children's Hospital of Philadelphia, PolicyLab. Managing the Health of Children with Asthma from the Hospital to the Community [Online]. Available at: http://www.policylab.chop.edu [Accessed: plug in date accessed here]. Perceived Access to Outpatient Care and Hospital Reutilization following Acute Respiratory Illnesses.